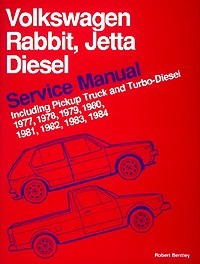 This Volkswagen Rabbit & Jetta Diesel Service Manual Including Pickup Truck covers the Rabbit Diesel two-door sedans, the Rabbit Diesel four-door sedans, the Jetta Diesel two-door sedans, the Jetta Diesel four-door sedans, and the VW Pickup Truck Diesels sold in the United States and Canada for the Model Years 1977 through 1984. This manual includes troubleshooting, service and repair procedures for the diesel engine and its direct-cylinder fuel injection system. This Volkswagen repair manual focuses exclusively on diesel models. You'll find testing, troubleshooting and repair steps from diesel fuel injection adjustment to the oil cooler used on models with automatic transmission and/or Turbo-Diesel engines.